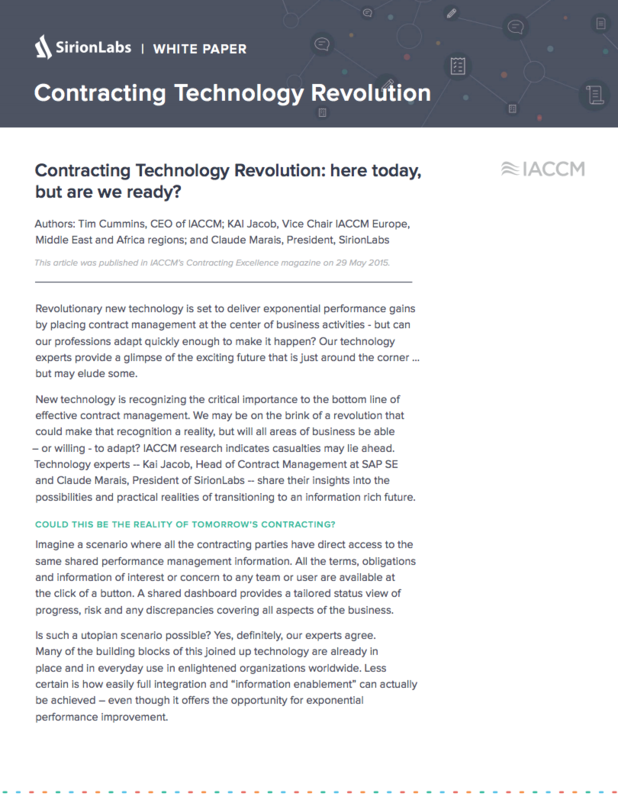 Download Article: Contracting Technology Revolution: here today, but are we ready? Revolutionary contract management technology is set to deliver exponential performance gains by placing contract management at the center of business activities. Capabilities such as granular tracking of contractual obligations and collaborative contract management across enterprise functions that used to be a distant dream are now available and can deliver significant bottom-line gains for organizations. The key question, however, is whether the industry can adapt quickly enough to make it happen? This question is not limited to the contracting function, but extends to other enterprise functions such as strategic sourcing, supplier management, delivery, IT, finance, and legal that stand to gain significantly by embracing this new wave of technology. Download our thought leadership article to read what our experts - Claude Marais President of SirionLabs; Tim Cummins, CEO, IACCM and Kai Jacob, Head of Contract Management, SAP SE – have to say on this exciting and relevant topic.